it’s starting to be that time of year where i’m just reeealllyyyy busy with work. messing around in the kitchen is not my priority. i don’t remember how i stumbled across this recipe – it might have been in a spaz moment of ADD while working (sorry, dan!) – but it sounded delicious and i had to try it. this dish holds a little spot in my heart. about two years ago i started dating this guy who caught my eye. we decided to stay in one night and i thought, “why not make it fun and make dinner instead of ordering?” and i also thought, “i’ll hook him for sure when he gets a load of how well i can cook.” this was the first meal i made for brad. i think i actually made it the night before to make sure i knew how to make it and not look like a fool in front of him. this dish is so simple, so tasty and so quick! perfect for a week night meal or a quick date night in meal. it was a long time since i made this dish so i thought it was time to bring some good memories (and flavor!) to the dinner table without too much time. 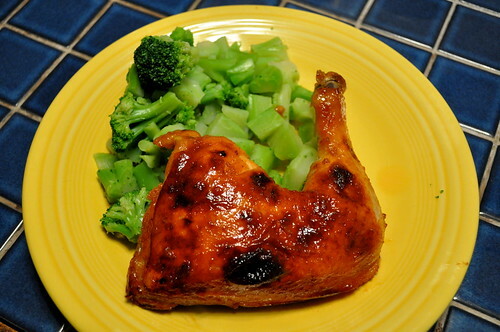 pound the chicken breast and sprinkle with salt and pepper on both sides. heat oil over medium high heat and add chicken. cook through turning once, about 10-12 minutes. 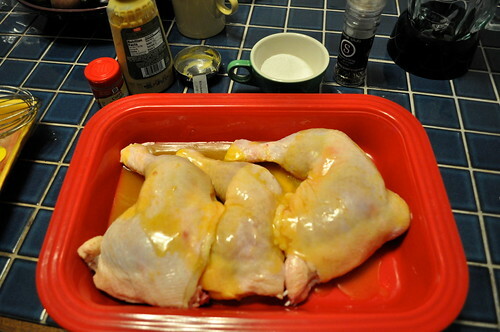 transfer chicken to a plate and keep warm. pour the wine into the skillet and stir until reduced by half, about a minute or so. whisk in the cream, mustard and tarragon until thick, about two minutes. right before serving, drizzle the cream sauce over the chicken. 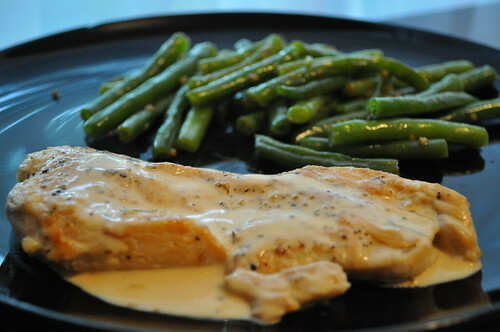 i usually serve this with asparagus but this time i used fresh green beans – boiled for about 5 minutes and then into a sautee pan that had a pad of butter and minced garlic cooking up. toss and serve. i said in an earlier post i would give you my homemade pasta sauce, and i’m delivering today. i’m more of a meat sauce fan than meatball fan. i will make meatballs from time to time to shake things up but for the most part, i’m a meat sauce kind of girl. i had some left over meat from making hamburgers the other day and being on the recent pasta kick, i decided to whip out my meat sauce – it’s been a while. in a pan over medium-high heat, spray with non-stick cooking oil and cook the garlic and onion until the onion is translucent. add the meat and brown. when the meat has browned, add the splash of red wine to deglaze the pan for about a minute or so. 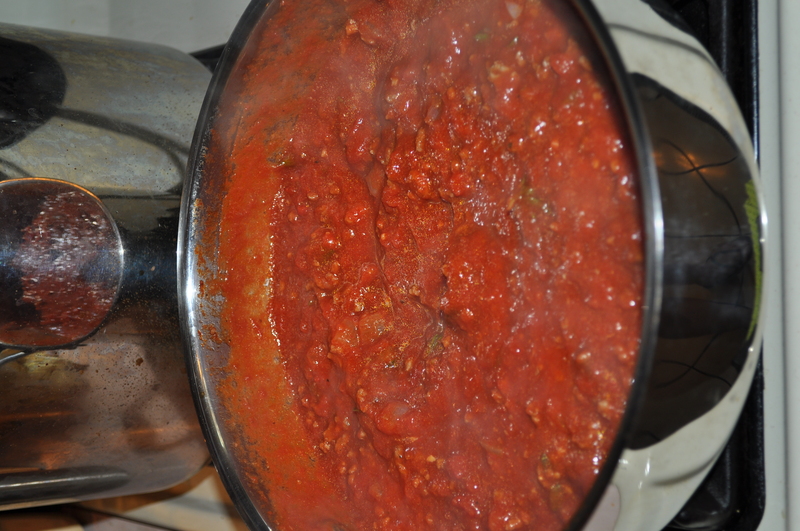 next, add the crushed tomatoes and tomato paste. stir well to mix the paste in. add a couple of glugs of worchestershire sauce, the squirt of mustard and the oregano leaves. stir well, cover and turn the heat to low. while the sauce is simmering, boil the pasta of your choice. 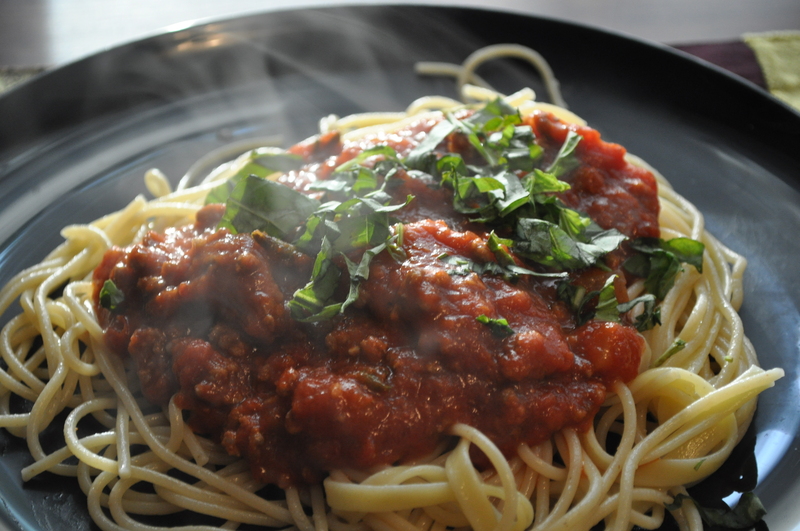 when the pasta is done, serve the pasta on a plate, spoon the sauce the pasta and top with basil. bada-bing. bada-boom. munja. this dish hits the spot every time. yum! i’ll never forget the time my mother insisted that we have a cook out in the middle of winter. i’m pretty sure it was during the blizzard of ’93. we all thought she was crazy talk but sure enough she stuck to her word. she went out side in her winter jacket armed with a plate of hamburgers and hot dogs, started up the grill and didn’t come back until the hamburgers had defined grill marks and the hot dogs were split. it reminded us all of the summer time as we ate our cook out foods and watched the snow fall from the dinner table. it’s raining once again in western PA. so what did we have for dinner to lift our spirits and remind ourselves sunnier days are in our future? hamburgers! i’m a week early on memorial day celebration but we can’t get enough of hamburgers. last time i made hamburgers with sautéed onions and a side of mac & cheese and broccoli. this time i went for more traditional toppings and sides. 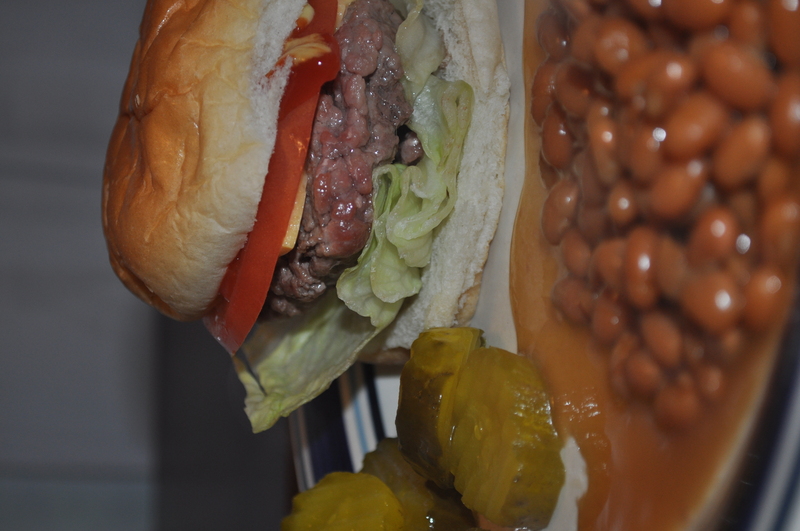 i used 1 pound 85% lean ground meat – having some fat makes for a juicy burger. i split the meat into four patties and grilled them for about 8-10 minutes, flipping once. while the burgers are grilling i prepped all of the add-ons. i cut the tomato, ripped apart the lettuce and started to assemble the buns. from bottom up – bun, lettuce, hamburger, cheese, tomato, ketchup, mustard, bun. nothing more, nothing less. i served these up with a side of pickles and baked beans. what could get more summer-tastic than this, folks? if it wasn’t for my grill pan, i don’t know what i do since i do not have an outdoor grill. and even if i did, it rained so hard and much i wouldn’t have been able to use it anyway! i love me some hamburger. yum!